Baba Yaga- Notes: Fiery dragon's blood incense, sweet woodsmoke, dried herbs, dripping candle wax and forest dirt. 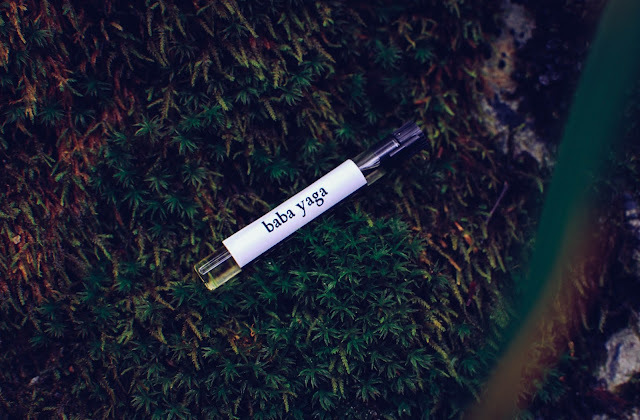 Smoky, earthy tones of incense and resins rise softly sweet and loamy from a hidden alter planted in the hollow of an ancient tree. The scent of minerals coalesce in the night air and a faint creaking of dozens of vague shapes crafted from unknown hands and composed of leaves and twigs and dried bones sway like ornaments in the tree's branches. When examined closely the scent on the air is dragon's blood but when eyes close and the wind is felt, the fleeting dreams of sweet smoke and resin surround the senses. 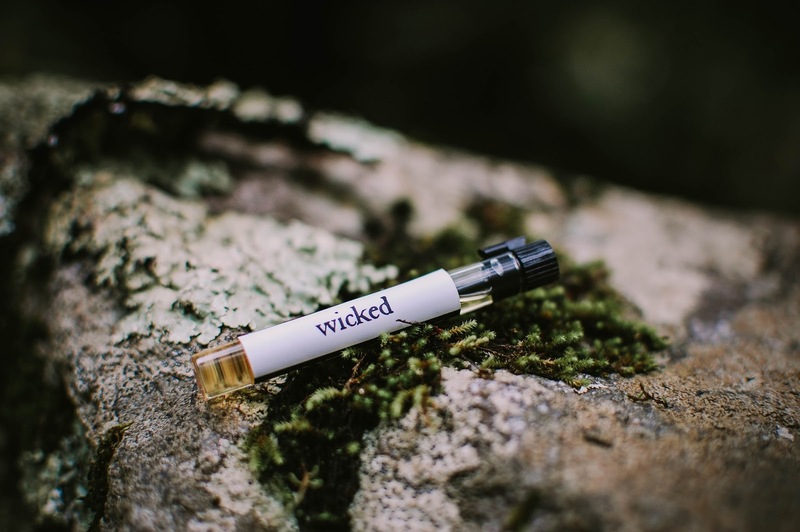 Wicked- Notes: Three vanillas, dark aged patchouli and almond buttercream. Fresh on the flesh, the trio of vanilla, patchouli and almond all mingle and swirl until the vanillas come into focus after a minute or two. These vanillas cast voodoo magic and smell of a gauzy black licorice haze and deep woods, drops of bourbon infused with sweet almond. All the while the patchouli hovers there in the background, the backbone of the spell, lending its ebony silhouette to the brew. Eventually the shadow of patchouli becomes a corporeal being and crawls across the skin, fragranting it with earth and herb, ink and smoke. 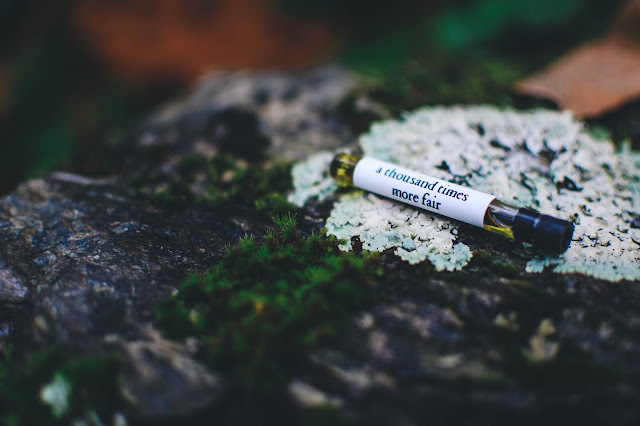 A Thousand Times More Fair- Notes: Honeysuckle nectar, magnolia blossom, passion flower, white peach skin, ripe plum, bright vanilla bean and delicate musk. Creamy indolic magnolia blossoms, with their heavy ivory petals and jutting column of yellow pollen dusted pistils and stamens rise from the fragrance. The white peach flesh that joins the white blooms still lingers green on the branch, not yet plump with sugars and juice. The fruits almost have a bergamot clarity and greenness. The drydown brings about images of crayon wrapping, papery and yellowed accompanied by grassy tones. This is where the magnolia petals that were pressed into a diary reside, left forgotten on a dusty shelf. Grimm- Notes: Cocoa absolute, tonka bean, tobacco, immortelle, wet forest moss and leaves. 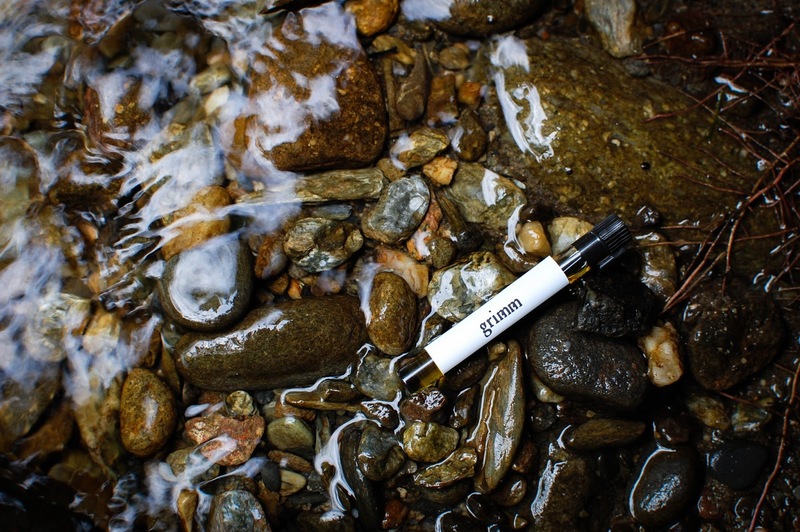 The vial of Grimm holds delicious looking dark brown sediment in the bottom of the vial, a few inversions pushes up the yummy fond into the perfume oil like a fragrant lava lamp. Grimm begins its story as an earthy Dutch chocolate treat, shadowy and foreboding of sinister things to come. Once the curling warm tendrils of cocoa and tonka lure you into the haunted glade, a whiff of the decaying leaves underfoot and glowing eyes peering through the spiderweb like moss cause your heart to stutter. Just keep walking. Don't let the sneaking vines catch at your ankles. Up ahead you catch the birdlike trilling of the mandolin and spy an old bearded man slouched by a tiny campfire. He glances up and his kind eyes nestle in the cloud of his pipe smoke. A crook of a smile barely lifts the corner of his mouth there the stem of his pipe is anchored. The sweet vanilla tobacco and soft green smoke welcome you to sit a spell and listen to the stories the mandolin knits together from the fire and stars and haunted clearing near by. These were four of the five scents I chose in the Sixteen92 Discovery Sample Set for $20. I did have fun and let Sixteen92 pick my 5th choice. I am certainly glad I did because it ended up being one of my favorites, which I quickly returned and picked up in a full bottle... Mercy Lewis. Review to come soon. Other favorites in this set were Grimm and Baba Yaga. I do find Sixteen92 scents to have a shorter longevity than some of my other indies. But at around 3-4 hours it is still nice. Sixteen92 recently had their anniversary sale and I ordered a Mystery sample set and two full bottles. Dis you participate in the anniversary sale? Are you in The Circle? Do you recommend it?